A suite of clinopyroxenite nodules, megacrysis and associated lavas from Somma-Vesuvius, Italy, has been investigated to establish its possible genetic relationships with the leucitebearing lavas of the Roman Region. The clinopyroxenites are essentially composed of clinopyroxene + mica and subordinate olivine, plagioclase, spinels, apatite and glass. The megacrysts are clinopyroxene fragments. The associated lavas are leucite-tephrites and a tephritic leucitite. 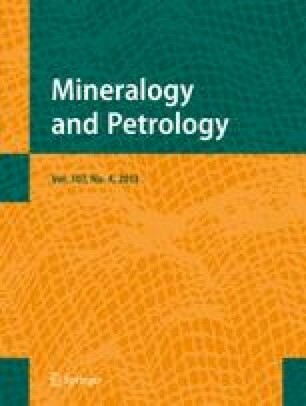 The mineralogy of the clinopyroxenites is distinctive but gradational to that of the Somma-Vesuvius lavas and reflects subvolcanic crystallization of a silica-undersaturated, mafic magma. The megacrystic clinopyroxene is probably related to the clinopyroxenites. The chemical composition of the clinopyroxenites shows strong affinites to that of the Somma-Vesuvius lavas and corresponds to leucite basanite compositions. Interstitial glass in the clinopyroxenites represents a residual liquid from clinopyroxenite crystallization. This glass approaches the chemical composition of the Somma tephrites. The experimental melting of two clinopyroxenites at 1 atm demonstrates that the essential assemblage of the Somma-Vesuvius lava, leucite + clinopyroxene, may develop from basanite compositions where olivine disappears by reaction with the liquid to form clinopyroxene. It is concluded that the clinopyroxenites represent basanitic magma crystallized at depth and that the Somma-Vesuvius leucite-bearing lavas are potential derivatives of this magma. Leucit-Tephrite und tephritische Leucitite der Romana enthalten Klinopyroxenit-Einschlüsse sowie Kristalle von Klinopyroxen, Glimmer, und untergeordnet Olivin, Plagioklas, Spinell, Apatit und Glas. Die genetischen Beziehungen zwischen Laven und Einschlüssen wurden an Hand der Ergebnisse petrologischer und geochemischer Untersuchungen überprüft. Die Mineralogie der Klinopyroxenite kann mit der der Somma-Vesuv-Laven korreliert werden und weist auf subvulkanische Kristallisation eines Si-untersättigten, mafischen Magmas hin. Die chemische Zusammensetzung der Klinopyroxenite zeigt deutliche Beziehungen zu den Laven von Somma-Vesuv und entspricht einem leucit-basanitischen Typ. Restschmelze der Klinopyroxenit-Kristallisation ist als Glas auf der Intergranulare erhalten. Die Zusammensetzung dieser Gläser ähnelt der von Somma-Tephriten. Schmelzversuche an zwei Klinopyroxeniten bei 1 atm zeigen, daß die wichtigste Mineralassoziation der Somma-Vesuv-Laven, Leucit und Klinopyroxen, aus einer basanitischen Zusammensetzung abzuleiten sind. Olivin verschwindet dabei durch Reaktion mit der Schmelze und Klinopyroxen wird gebildet. Die Untersuchungen lassen erkennen, daß die Klinopyroxenite Kristallisationsprodukte in der Tiefe erstarrter basanitischer Magmen sind, und daß die leucitführenden Magmen von Somma-Vesuv als mögliche Abkömmlinge dieser Magmen zu sehen sind.